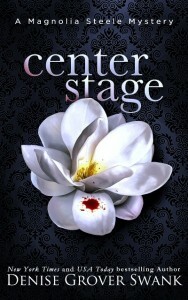 Today is release day for Center Stage, the first book of my new Magnolia Steele Mystery series. I love this book, but I REALLY love this character. Magnolia quickly wormed her way into my heart. The story is set in Franklin, Tennessee, a suburb of Nashville. I lived there for three years and I absolutely loved it there. Beautiful landscape and some of the genuinely nicest people I’ve ever met. While Franklin is a lot more sophisticated than Henryetta, Arkansas, the fictional town that is the setting for my Rose Gardner Mystery series, it still has a lot of heart. It’s definitely one of my favorite places. Still, those of you who read my books know it’s all about the characters for me. Magnolia easily ranks as one of my favorites, but this book is packed with other characters who have captured my heart. There were two surprise characters–neither of them in my rough synopsis for the book–but once they landed on the page (or my computer screen, as the case may be) I KNEW they had to stay. I quickly worked things around to make them fit seamlessly into the overall story arc for the series. Colt Austin is a country singer wannabe that works for Magnolia’s catering company. Charm just oozed off him and I knew he’d be fun to keep around. The second was Belinda, Magnolia’s new sister-in-law. Belinda Steele first appears as this overly sweet woman, fangirling over Magnolia and her Broadway career. But as I got to know Belinda, I discovered a depth of character I haven’t seen since Neely Kate first landed in my head with Twenty-Nine and a Half Reasons. To say I’m eager to see what develops between Magnolia and Belinda is an understatement. The Magnolia Steele Mystery series will have self-contained mysteries, but there will be an overall story arc that centers on what happened to Magnolia the night of her high school graduation. What made her flee everything she knew? This series WILL have an end. I’m not going to put a definitive number on that yet because when I tried that with my Chosen series I had to bump it from three to four books. With the Magnolia Steele Mystery series, I will say that I anticipate that the story will need 4-5 books to tell it effectively. We’ll see how it goes. My plan is to try to release a book in this series every six months. I will also try to release a book in the new Rose Gardner series every six months. But scattered around those releases, I’ll have others as well. I’m excited to partner with Forever, an imprint of Grand Central, to bring you a spinoff series to The Wedding Pact series, titled Bachelor Brotherhood. The first book, Only You, releases in eBook format in June and print in October. I also have a young adult contemporary romance with Blink coming out in June as well. I’m so excited to share my love of Paris in One Paris Summer. My daughters begged me to write this story, but while it very much appeals to teens and middle school-aged readers, I believe it has something to offer older readers as well. This isn’t just a love story between two teens. One Paris Summer delves into relationships– Sophie and her estranged father, Sophie with brother, a relationship that changes when they move into their father’s Parisian apartment. Sophie’s animosity for her soon-to-be step-mother and how it evolves. I hope my readers who stick to strictly adult books will consider giving One Paris Summer a try. I have a lot of things coming up and I’m so eager to share them with you! How can you stay connected? Join my newsletter. I let you know about cover reveals, new preorder links, new releases, and special offers, such as sales or free reads. Like my Facebook page–I often have contests and share information there first. Follow my Facebook profile— I’m pretty chatty about my life and my kids. Follow me on Instagram–I post here on a semi-regular basis, but I post a LOT when I travel. Follow me on Pinterest–I sometimes pin book related things, but I confess to pinning a lot of recipes and decorating ideas. I love the series. I hope Rose and Joe get back together. I can not put my nook down. Rose Gardener and Neely Kate are so life like. I feel like I’ve known them and watch them grow up. I’m 56 years old and love this series and can’t wait to start the investigation series. You are one hell of an author.